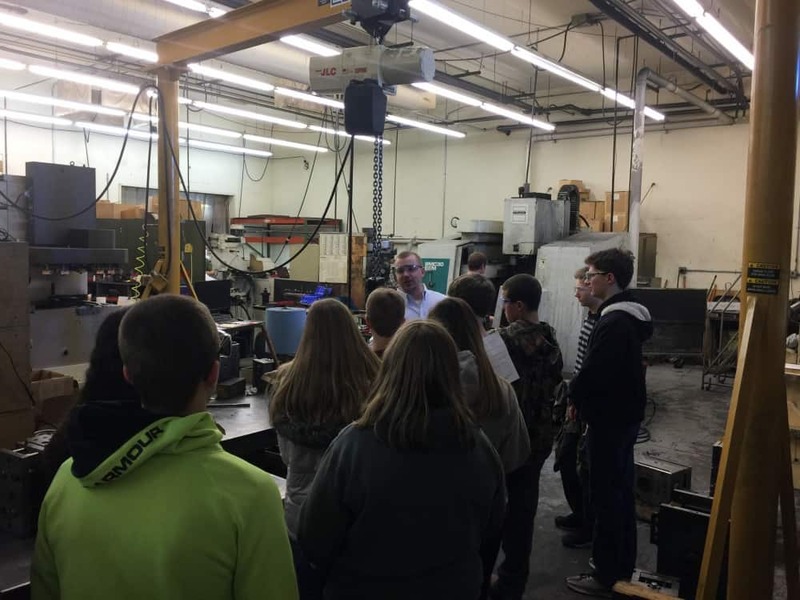 Lewiston, MN March 15, 2018 – PlastiCert, a veteran of innovative and quality plastic injection molding design and manufacturing services for over 35 years, yesterday hosted Lewiston–Altura High School’s Freshman Career Readiness Class. The class was divided into half. One group accompanied Direct of Operations Ben Ninas on a tour of the facility. The other group participated in a presentation and discussion on careers in manufacturing with PlastiCert President & Owner Craig Porter. The groups traded places halfway through their class period. Prior to their visit, the students had watched YouTube videos of injection molding to pre-orient them as to how PlastiCert’s production floor equipment operated. During the tour, Ninas went into higher detail on the equipment being utilized and the various tasks and responsibilities being carried out on the production floor. In the classroom, Porter explained how PlastiCert is a custom service molder, meaning they have no products of their own and everything they make is for the numerous OEM (original equipment manufacturer) customers to facilitate assembling their products. Therefore, PlastiCert is all about service and providing technical services in a discipline that their customer has chosen not to want to support directly, but is widely available in the supply chain. As such, service and the business relationship is what differentiates you from your competition. Targeting our region with data from the MN Department of Employment and Economic Development (MN DEED), Porter started out orienting the students as to how many people work in manufacturing nationwide (around 10%), and then in SE MN (about 18%). He then shared them charts and graphs showing while manufacturing represented 18% of jobs, manufacturing workers garnered 23+% of the wages in SE Minnesota. He then showed them manufacturing jobs had consistently paid 25% more than all other industries combined. “I made an analogy for them between an entity they were familiar with and then compared it to a manufacturing company,” said Porter. “We talked about watching basketball on TV and who do they see, players, coaches, referees and fans. Then pointed out that what they don’t see are trainers, purchasing, sales, marketing, logistics, planning, front office, etc. I then wrote next to those groups, the equivalent groups in a manufacturing company which was very similar. Then really stressed how many positions in departments like Human Resources, Purchasing, and Materials management that are non-technical positions. They discussed the education and training utilized by the various personnel. “None of them knew what we did coming into the tour”, commented Porter. “Their teacher Thomas Dickey had requested the tour to come and see what is done in their own home town. They had prepared questions asking about careers, amount of education, classes we would recommend for preparation to work at PlastiCert. Some questions centered on college, where to go and how to pay for it. While Porter provided answers regarding managing college, he pointed out many careers within PlastiCert and its service providers did not require a 4 year degree. Feedback from previous student visits indicate that they are quite impressed with the production floor equipment and the product being made. They also want to know more about the education necessary for the possible careers they heard about but had no prior knowledge.